I have been craving some pasta and sauce so I made stuffed peppers last night. I really can’t go very many nights without eating some form of Italian dinner involving pasta. 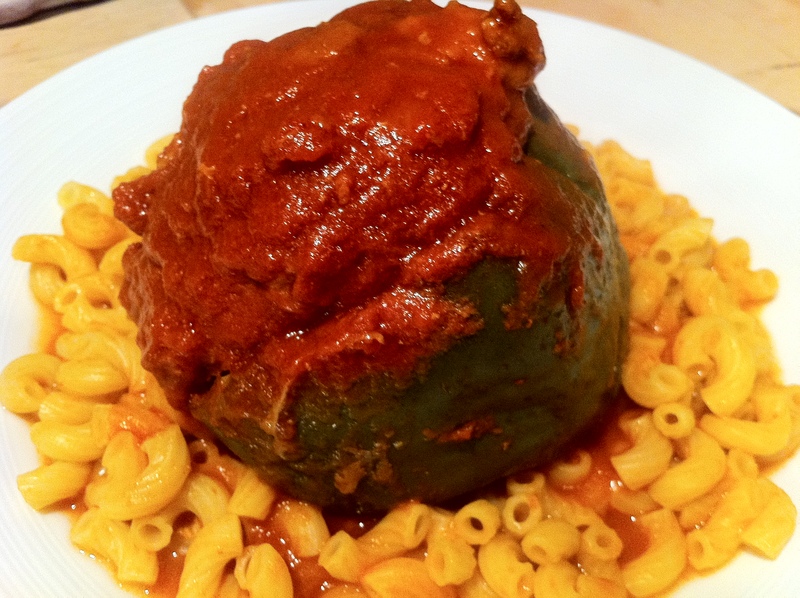 The stuffed peppers do not include pasta stuffed inside but I like to cook some and serve the pepper on top of a mound of macaroni. Whenever I make these it reminds me of home. My mom used to make stuffed peppers a lot when I was growing up… which is probably why I get cravings for them now. I put my own little twist into them every time I make them. This version includes hot Italian sausage and ground beef. Cut the tops off the peppers and clean out the insides. You will be left with a pepper you can stuff your filling into and it should stand upright. I use a chili pot that six bell peppers fit into nicely. Remove the stem from the top part of the pepper. You’ll have pretty good amount of left over bell pepper from the six tops you cut off. This will be mixed into the meat filling. Add the pepper tops, onion, garlic, rosemary, thyme, and parsley to a food processor. Pulse the veggies and herbs until they are mixed and cut into small pieces. In another bowl, beat the eggs and cream together. Cut the bread into small cubes and sprinkle it with a little water to make it moist. Add the vegetable mixture, eggs and cream, sausage, meat, bread cubes and salt and pepper to a large mixing bowl. Mix everything together using your hands until well mixed and it is sticking together. Divide the mixture into 6 portions. Stuff each pepper with the mixture and place them into the pot, standing upright. Pour the tomato sauce over the top of each one and cook over medium heat for about 30 minutes, spooning the sauce over the tops of the peppers periodically. Turn them down to low and let them simmer for 30 minutes more. The peppers will become soft and tender, the stuffing will be super moist, the sauce will become thin and a little spicy. Serve the peppers on a bed of cooked small pasta (like elbows or ditallini) or with some nice crusty bread and butter to soak up all the yummy sauce. Mmmm…. Just like my mom used to make. I had a great dinner with Dan out on the back deck last night. The weather was breezy and cool outside, it reminded me of a nice fall day. 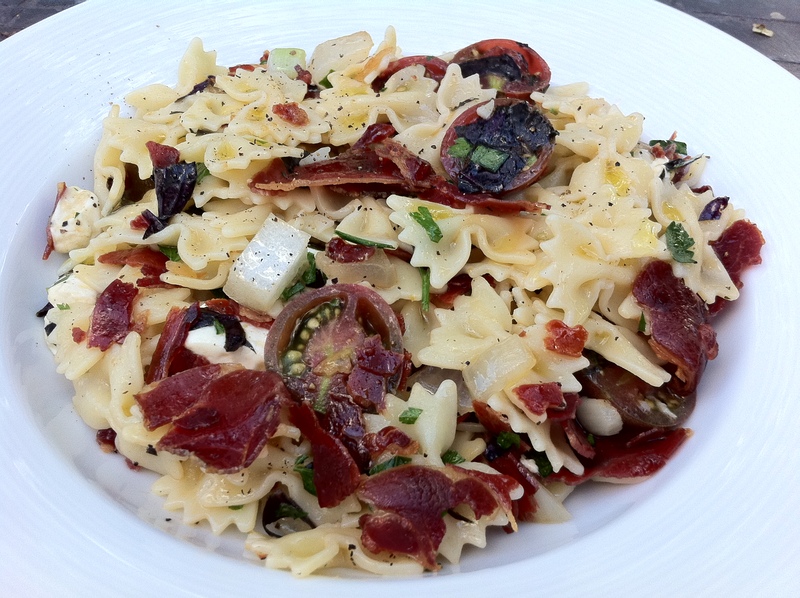 It is still the last bit of summer and the tomatoes are still flowing so I made another pasta dish with raw tomatoes. I got these really nice heirloom cherry tomatoes from Sweet Annie Produce at Central Market this week. They were dark in color almost looking forest green on top. If you want to find them, the variety is called black cherry. It’s supposed to be easy to grow and have a sweet smoky flavor. I think they are great for pasta dishes because they are pretty hearty and hold up to some bolder italian flavors. Good tomatoes are such a bargain this time of year and we are eating a lot of them. I feel like I should eat my fill because come October they will start to disappear. Fun fact I learned from the Today Show on Monday: Tomatoes can help prevent sunburn… because of the phytochemical lycopene! I wrote a whole paper on lycopene for my nutrition class in college. I think phytochemicals are pretty neat <insert dork comment here>. You could also build up your lycopene by eating ketchup. Lycopene actually intensifies when it is cooked! 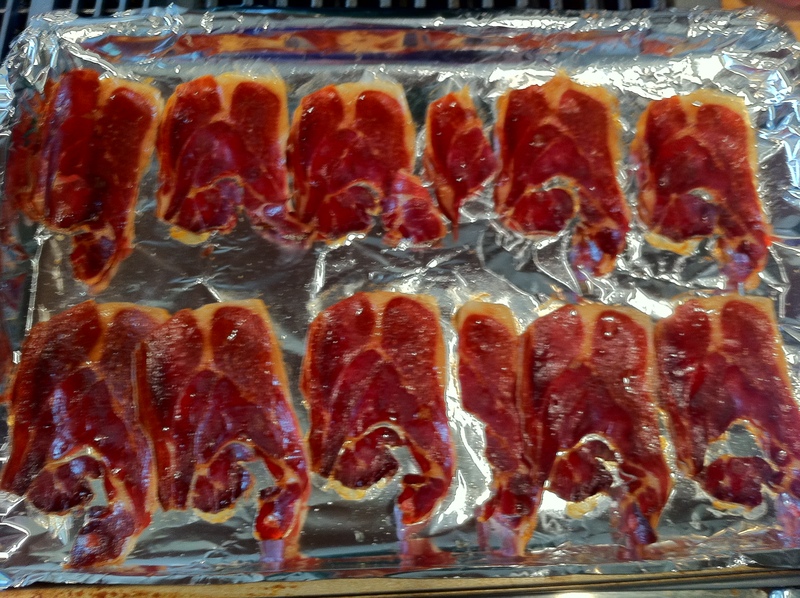 Lay the slices of prosciutto on an aluminum foil or parchment covered baking sheet. Place it in the oven at 375 degrees for 10-15 minutes (depending on how thick your slices are). The prosciutto will turn crispy and brittle and look kind of like bacon. Let it cool before handling it, it will be hot! When it cools you should be able to crumble it into small pieces. It is so much better than bacon! Once you try making this you’ll have a hard time going back to bacon crumbles for your salads. 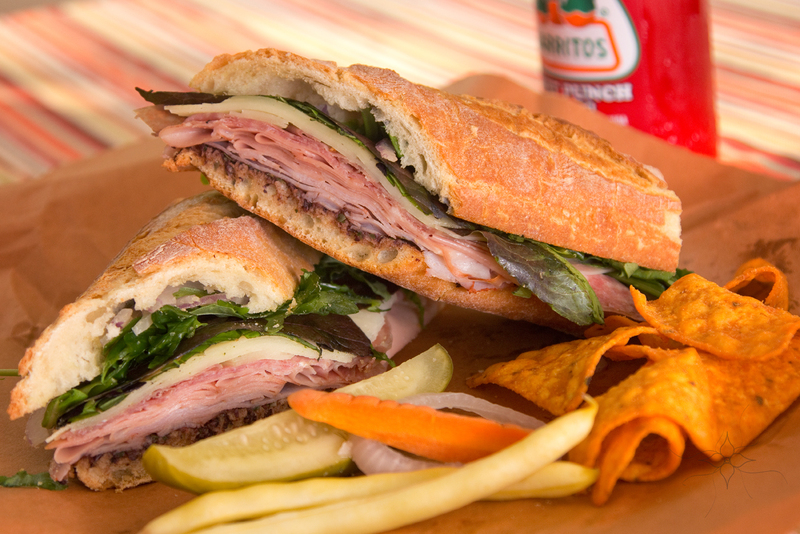 You can use the crispy prosciutto on anything! It is great with eggs, salads, sandwiches, and pasta. Try putting it in potato salad, yum! Just a note* these slices were a little small so I used extra, I think they were cuts from the end of the piece of prosciutto so they were not as long as slices of prosciutto usually are. This filled up a medium sized baking sheet in a single layer. Use however much you want, it really depends on how much you like it! Cook your pasta to Al dente and prepare your other ingredients. 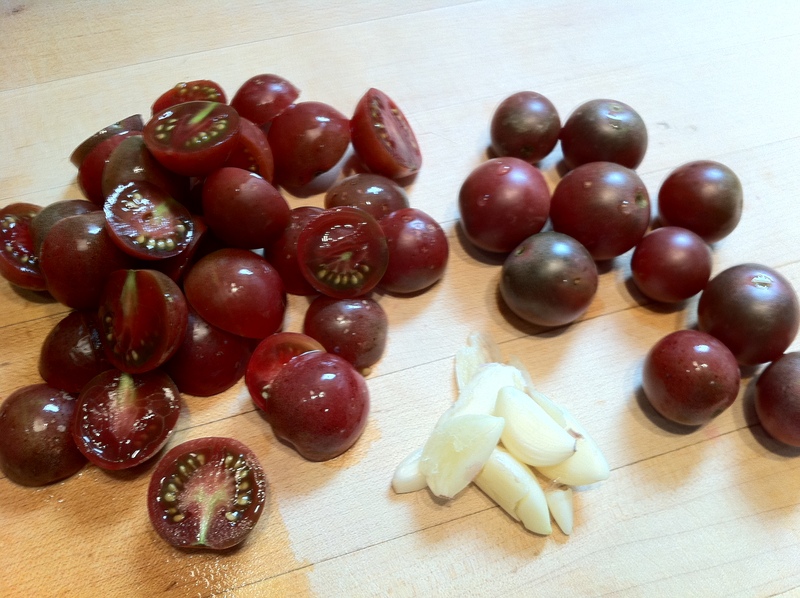 Slice the black cherry tomatoes in half. If you can not find heirloom cherry tomatoes, use any kind of good cherry or grape tomatoes. 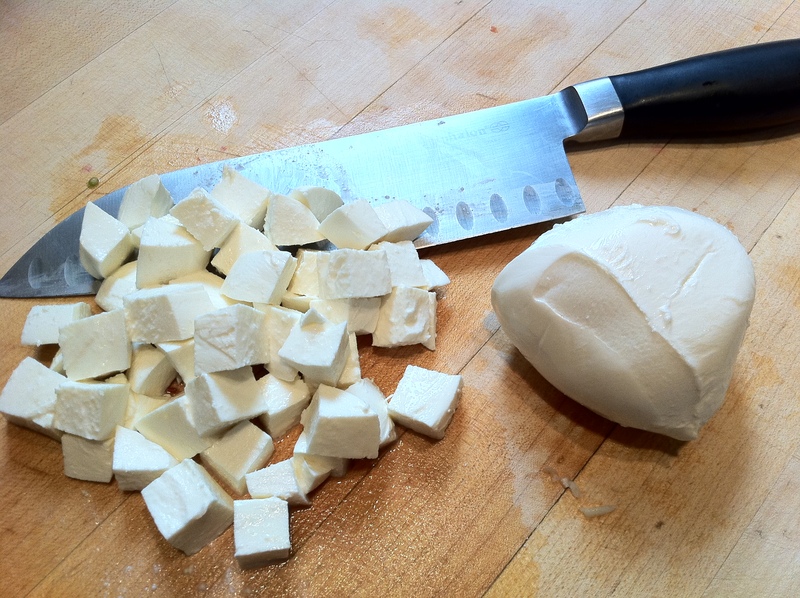 Cube the fresh mozzarella, chiffonade the basil and chop the parsley. Mix these ingredients together and season with salt and pepper and drizzle with olive oil. 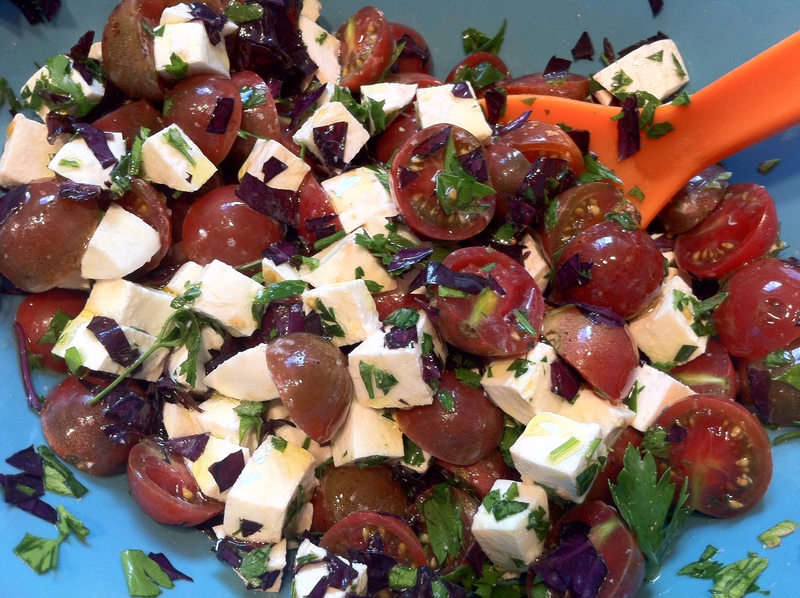 You could eat it just like this too, it makes excellent tomato basil salad! Saute the onions and garlic until the onions begin to turn translucent. 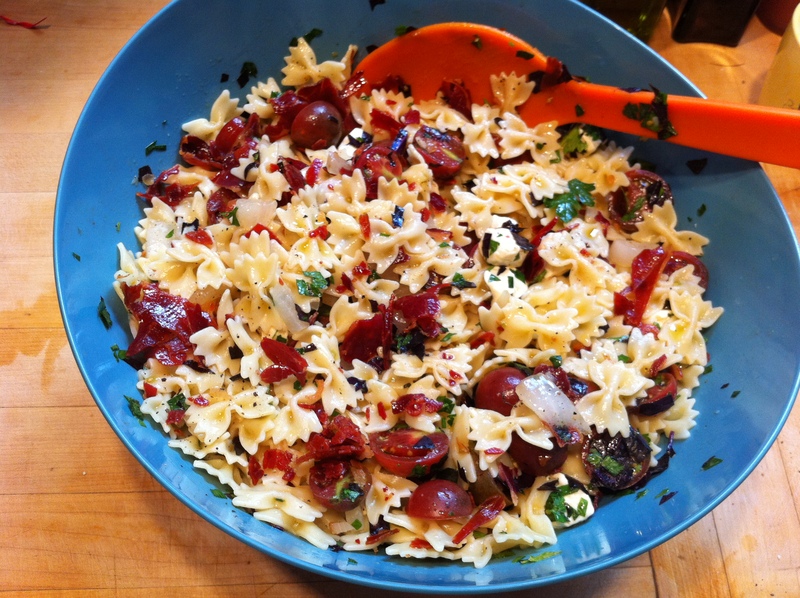 Mix the onions and garlic into your tomatoes and mozzarella mixture, add in your pasta and crispy prosciutto and drizzle with a little more olive oil. Season with salt and pepper to taste and you are done, easy! I had a little white peach sangria with this dish and enjoyed a great dinner on the deck.